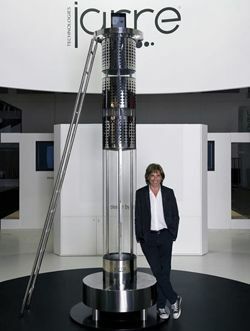 IFA 2011: Jean Michel Jarre unveils 11 foot tall, £300k iPod dock | What Hi-Fi? Jarre Technologies calls the AeroDreamOne "the most extraordinary creation in the history of recorded sound"
Jarre Technologies, the brainchild of Jean Michel Jarre, showcased a collection of outlandish iPod and iPad docks at IFA in Berlin. Standing head and shoulders above the competition, the AeroDreamOne strikes a staggering pose at 11 feet tall, complete with a ladder for access. Weighing 394kg (that's 62 stone) the AeroDreamOne is rather boldly described as "the most extraordinary creation in the history of recorded sound: half machine, half work of art". A prototype for now, it claims to be able to get the best from "vinyl spinning at 33rpm on a turntable to the tiniest MP3 player, and every known format in between", and will pump out 10,000 watts of power. Back in the real world, Jarre Technologies also announced the AeroPad One and AeroPad Two docks, both slightly more affordable. The AeroPad One has an Apple connector, USB input and auxiliary input. With two 30-watt speakers, a 60-watt subwoofer and AirPlay integration, it has a 499 euro price tag. There's also a bigger brother, the AeroPad Two. It's 699 euros, boasts more power and a landscape rather than portrait design. Both the docks support the iPad as well as other iOS devices. While the AeroDreamOne will surely remain something of a one-off, the AeroPad docks certainly look more interesting and realistic additions to the premium iPod dock market.